Business law or commercial law refers to the laws that govern the contractual dealings between individuals and entities. Much of business law deals with contractual negotiations and dealings, and then drawing up well-drafted agreements so that they may avoid conflict or liability in the future. Need help with a reviewing your lease or drafting a partnership agreement? Let us provide the formalities. A Personal Injury situation is when a person’s body, mind, or emotions are hurt, usually due to the negligence or carelessness of another. It includes everything from motor vehicle accidents, medical malpractice, and severe accidents involving situations where an injury is so severe that it is fatal. The injured party usually seeks damages from the party that caused the accident. Have you or a loved one been injured? Confused or stressed by the insurance claims process? Then let us help you navigate the formalities. Civil litigation involves virtually every type of dispute that can arise in the person-to-person conflicts, business disputes, breaches of contract, partnership/joint venture disputes, class actions, personal torts, business torts, civil RICO claims, shareholder issues, and many other situations which justify filing a court action against someone else. Whether it is for commercial or personal disputes, let us assist you in your case and resolving your dispute. Sexual Abuse & Harassment cases are sensitive matters and need to be treated with the utmost care due to the victim’s feelings, the evidence, and public sentiment. Our team works tirelessly to hold the perpetrators of sexual abuse responsible, whether they are public or private institutions, employers, or the individual abuser. Our attorneys utilize their years of experience and all of their skills to ensure you receive the justice and compensation you deserve. Compliance issues revolve around businesses satisfying legal requirements to operate, such as licensing, permitting, or oversight. This could include government reporting, obtaining a liquor license, or transferring a boat’s commercial permit. Business owners spend a significant time doing their own compliance. Reading regulations, filing forms, attending administrative hearings, and dealing with regulators is not usually how a business makes money. Therefore, it may be time-saving to hire an attorney to assist you with the government’s regulatory matters. 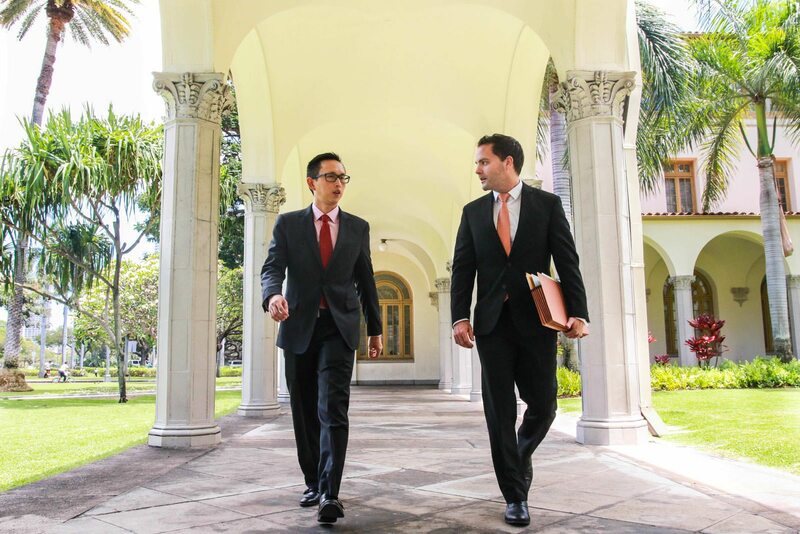 Hew and Bordenave, a Limited Liability Law Partnership LLP, is a Honolulu-based firm that handles business law, personal injury, and civil litigation matters for clients in Hawaii and California. Whether the goal is to advise business owners on contract and compliance matters or represent our clients in trial, Hew and Bordenave is outcome oriented and results driven. For more information about our attorneys and staff click here. For commercial matters we have assisted clients in forming business entities, buying and selling their businesses, administering of corporate governance, filing for government and licenses, registering trademarks and trade names, and dealing with breach of contract matters. Our client are in several industries, including as professionals, food, application and software development, social media and web services, professionals and consulting, solar, construction and design, licensed contractors, and retail. We also spend time educating our clients when they are considering contractual arrangements. When it comes to strategic planning adopt a holistic approach, that is we will coordinate and work with the client’s other advisers, such as accountants and financial planners to try and meet the personal goals and objectives of the client for their business deals. We also recognize that business relationships do not always work out and we are there ready to assess your situation and provide options when navigating business divorces. So if you are a small to medium-sized business owner that needs help with their business deals, compliance issues, or breach of contract claims, then reach out to us and let us provide the formalities. If you, or a loved one has been injured in an accident, victimized in an abusive relationship, or just sick of dealing with games being played by the insurance companies, employers, government/school/church officials, then rest assured that we’ve successfully resolved a wide range of personal injury matters. When you or your loved one has been hurt, the last thing that should be on your mind is figuring out the complexities of the insurance claims process, or how to assert your rights and seek the justice you deserve. We navigate our clients’ cases through the legal maze, and are strong advocates for acquiring the compensation they deserve for the injuries they have suffered. Whether it is a car accident, slip and fall, workplace harassment, or sexual abuse, we work tirelessly to achieve the compensation you deserve. If you or a loved one has been injured, please consider coming in or calling for an free case assessment. You should not be afraid of the law for redressing your injuries. We can explain how the process of filing a claim related to your type of injury. So please don’t fear the formalities, and take the first step and call or email us today.